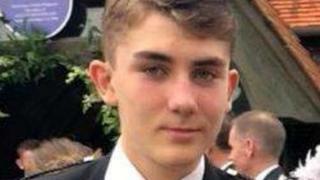 A candlelit vigil in memory of teenager Liam Smith will be held in Aberdeen city centre, a week on from the discovery of his body. A major search was launched for the 16-year-old after he was reported missing on 17 November. Liam was last seen getting on the 202 Stagecoach bus from Aberdeen and is thought to have got off at Crathes. A member of the public discovered his body in remote woodland south of Banchory, Aberdeenshire on 22 March. A Facebook event page has been set up for the vigil, which will be held at the water fountain on Broad Street at 20:15. Organisers confirmed a two-minute silence will be held during the tribute. It is expected to feature a contribution from Aberdeen author and blogger Bradley Allan. After police confirmed Liam's identity on Monday his mother, Alix Smith, thanked everyone who took part in the search. She added: "Our hearts are broken."